Peeing in the Swimming Pool — 1 in 5 Admit Doing It! We borrowed this blog posting from our friends over at Pool Water Testing because not enough people realize the potential health problems that can result from peeing in swimming pools. The results of a recent study revealed that 1 in 5 Americans admitted to peeing in the pool. Keep in mind that more people probably pee in the pool and just didn’t want to admit it. Gross! If you’re taking a refreshing dip in a pool with four other people, odds are one of you is urinating. This is not gross-out myth, but cold, depressing fact from a recent survey conducted by the Water Quality & Health Council, a scientific research group sponsored by the American Chemistry Council. The survey, conducted in April, asked nearly 1,000 adults whether they urinate in pools. One in five bravely admitted their mistakes. And those are the ones who admitted it. It is easy isn’t it? Maybe that’s because many of us were taught as kids that chlorine counteracted any accidents. Technically, that’s mostly true. If pool operators maintain proper chlorine and pH levels, most waterborne germs are killed on contact. But 54 percent of public pools tested by the WQHC last year failed to provide the proper chlorine levels and 47 got low marks for pH balance. You can blame poor pool maintenance, but frequent urinators don’t help. To find out of your pool is safe, look for some tell-tale signs of bacteria. Do us all a favor, folks and PLEASE stop peeing in the pool! The Center for Disease Control has monitored pool water quality for many years now and the number of illnesses contracted from contaminated swimming pool water has increased steadily. Some blame the increase on poorly maintained pool water but in the end it comes down to one thing in our minds: Garbage In, Garbage Out. Shower before swimming: If everyone removed the oils and other bodily secretions from their bodies before entering the pool the chlorine and filter would have less to clean up. Shower after swimming: Clean the pool off of you after a swim. We suggest this for two reasons: 1) Chlorine dries out your skin; 2) Perhaps a fellow swimmer, one of the 20% that admits to peeing in the pool, unknowingly had a contagious health condition that he or she passed into the water at some point. Do you REALLY want to walk around with THAT on your skin the rest of the day? Aside from showering before a swim and using the proper urine receptacles (Toilets, people! Use the toilets!) when nature calls, keeping an eye on pool water quality will go a long way towards making sure everyone has a safe, clean and enjoyable time in the pool. 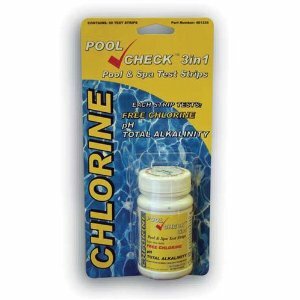 Detecting a strong chlorine smell in swimming pool water does NOT always mean the water is safe. 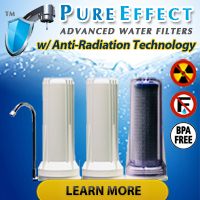 If, for example, the pH goes out of range the chlorine will not work nearly as effectively at neutralizing unwanted bacteria and other organic contaminants. Therefore we, like the article, suggest testing pool water before diving in. Easy-to-use pool water test strips like the Pool Check 3-Way test kit give accurate, reliable water test results for free chlorine, pH and total alkalinity in under a minute. So what have we learned? Hopefully you have learned NOT TO PEE IN THE SWIMMING POOL ANYMORE and will urge all those around you to stop peeing in swimming pools, lakes, oceans, rivers, etc., too! Oh, and we also suggest maintaining proper water chemistry in your pool at all times. This means you will need to TEST the pool water for critical pool water quality parameters including, but not limited to free chlorine, total chlorine, pH, and total alkalinity on a regular basis. 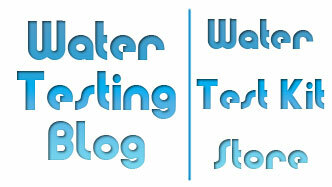 For that task we recommend Pool Check 5 Way Test Strips currently available in our Water Test Kit Store. This product comes in a bottle of 50 and has a total test time of less than a minute! While we would LOVE to think all operators of public pools keep a vigilant eye on the quality of their pool water… we worked in the pool industry for a while and came across a number of pools that LOOKED clean and tidy but had all sorts of water quality issues that could have resulted in swimmers getting sick if a harmful bacteria or parasite had found its way into the water. Before hopping in the water you should take a minute to use a product like the Pool Check 5 Way Test Strip to make sure the water contains, at the very least, a proper amount of free chlorine. « Lots of Americans Pee in the Pool… a Cold (Warm) Fact!